Amazon on Tuesday launched a dedicated iPad-optimized Kindle Store at amazon.com/iPadKindleStore/. Originally, Amazon’s Kindle e-reading app for iOS included a link to its Web-based store; in July 2011, Amazon removed that link to comply with Apple’s stricter policies. The new, touch-friendly, Web-based Kindle Store steers clear of violating Apple’s rules. The iPad Kindle Store website offers a large, horizontally-scrolling list of ebooks recommended for you, quick links to sections like New York Times Bestsellers and Newsstand, and the top 100 paid and free Kindle books in the store. The touch interface is straightforward to navigate. It includes book details, user reviews, and the ability to preview a sample of the book. The Web store also prompts you to add an icon pointing to it on your iPad’s home screen—by tapping the Action button and then the Add to Home Screen button. 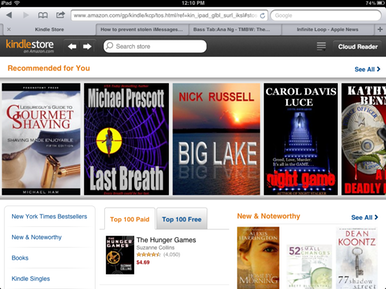 Once you purchase a book, you can choose to read it in the Kindle app, or read it in the Web-based Kindle Cloud Reader.